Matt, I use Google Reader, but I think you’re right – your blog cannot be seen as an accurate representation since it’s bound to be skewed to GReader/iGoogle. The most surprising thing I’ve noticed recently is the “I follow this blog” popping up all over blogspot. Real people, forming a real social network of sorts. I don’t even know how those subscribers get tracked, but I imagine that is a large chunk and growing very quickly. I am totally skewed – all my good friends use GReader, and I recommend it multiple places on my blog. FWIW, I have approximately 30% subs through GReader for a personal development/lifehacking site, most of the other 70% is divided fairly evenly among 10 readers and then handfuls in niche readers. Matt endorsing a Google product over a third-party product? No way! I couldn’t agree more. I’ve been through a good number of RSS readers before I settled on Google Reader. It was just the best, no question. My (somewhat limited) feedburner stats suggest the same as yours: Google Reader is far more popular than Bloglines. I’d use Google Reader if it wasn’t Google’s… I give Google so much info about my online activities I can’t stomach letting them also monitor what I read, how often I click thru to what I read, etc. I’m totally glad it is branded as Google Reader, because otherwise I’d never know if my reader was feeding everything back to Google. Modern Times, for sure, but no matter what the era, it is never wise to allow any one entity know everything about your reading habits and online interests. Google has a very long way to go before it can be trusted that much. My stats show the top 3 as 28% from Google, 11% Newsgator, 10% Bloglines. I switched from Bloglines a couple of years ago, I found the interface somewhat clunky. I think you will find most people have more Google Reader subscribers than any other. Feed Stats: Google Reader defiantly up on both personal and work sites. I know several friends who have started using RSS feeds and all of them went to Google Reader. I personally use it and love it, it’s fast and I use so much that is Google’s already whats one more. Seriously, good design, tons of information when you need, fast, clean, free, access from anywhere and keep up to date. Google is the Apple of the Internet world. Google reader still doesn’t support http authentication, and still mangles usage instructions within the xml headers. Why don’t you delve deep into why it takes years for Google to support fairly basic features supported by “inferior” products like Bloglines. I believe Google Reader is a strong product, but despite the high uptake, there is still a lot of work to do in other areas to make it a more “rounded” product. I haven’t used Bloglines in years. It was good, then it stagnated. I used Reader, then a standalone app, then with Chrome I went back to Reader. I just wish Chrome’s RSS autodiscovery was available now. Everyone that uses Google Reader seems to never unsubscribe from blogs. Any thoughts? Our non-techie cake blog has 47% using feedblitz. However, google reader is the most popular aggregator by far with 40% share. I use Google Reader as well and I absolutely love it. Very fast, easy to use, and works great on my iPhone. Matt, be sure to check out the Internet Marketing Top Blogs list here: http://www.winningtheweb.com/im-top-blogs/ You’re ranked at #3 ! I agree… according to my own stats.. my Google Reader subscriptions are more numerous and growing faster than other blog reading services. FeedBurner is measuring the total amount of possible subscribers that could possibly be reading your feed through online aggregator’s proxies. Bloglines may have 5150 accounts subscribed to your feed but those 5150 userids may never log in to view the content. Do you have accounts on multiple online aggregators? Did you delete all your subscriptions from the old aggregator and request account deactivation before moving on to a new way of feed reading? Likely just popped over to the new service, set things up, and started consuming. Still interesting stats but the numbers behind the numbers are worth a mention. john andrews, out of curiosity, what do you use? Just surfing, or Bloglines? Maybe Netvibes or something else? Andy Beard, I agree that password-protected feeds would be a really nice addition to Reader. Niall, I agree that readership stats could be better. It would be nice to know about active reading as opposed to passive subscribing. I think I’ve maybe 150 Google Reader users and 100 of everything else combined. Most friends with blogs show similar proportions. Bloglines usage has been going up again recently, though, I suspect because of the iPhone, which lacks a native Reader app. I’m happy enough with the Reader webapp for iPhone myself, once I change the settings so as not to use the Google mobile browser translator thing for outgoing links; that is, IMO, a ridiculous default for the iPhone. My reach at Strobist is similar to yours (40k subs) and I have 42% Google Reader vs. 5% Bloglines. Feedburner email, Firefox and News Gator are also ahead of Bloglines, FWIW. p.s. Thanks for the SEO education over the years, too! – The first feed is #11 on the Bloglines Top 1000, so it is certainly a bit skewed toward Bloglines. But it also has probably half a million iGoogle subscribers, and apparently Feedburner doesn’t have a way to count them. – The second feed doesn’t appear to be a default on Newsgator online, so I can’t understand why it would be so popular it keeps Bloglines and Google under 3%. For me, it is like 75% Google Reader. I have tried every other reader, and GR is jut the easiest and takes less memory for me.. I use Google reader after using Firefox for ages. If Firefox came up with something similar/better than the current solution, I’d switch back for the very same reason John Andrews notes. The less any one entity knows about you, the better. Sure there might be good intentions behind ideas now, but when stuff really starts going pear shaped, you have no idea what companies can be capable of. I wouldn’t be surprised if that’s why the Guardian didn’t recommend Google reader actually. I’ve used greader since my first time touch RSS.I still use it now,but in my own computer I always use outlook. I use Google Reader and everything else I see Matt Cutts using. I figure you can’t argue with success. I had a statistics project on my blog last month, with eight photography-related blogs submitting numbers, and “Google Feedfetcher” was a clear #1 for every single one. Granted this is obviously not a scientific study and it’s focused (no pun intended) on a single topic, but I was surprised when one of the measurements sites (forgot which one) was talking about a big Bloglines market share number. While my total numbers aren’t quite as impressive, the percentages are a little different. Personally, I prefer Bloglines but not the new beta version. But I doubt I’ll switch. Since we share computers, I set my wife up with Google Reader so we can track the same sites separately. I for myself use Google Reader (even though it reacts less good when using keyboard shortcuts since the updates). I think Google Reader may have some problems with the subscriber number recently. I use Feedsky, a similar service to Feedburner in China, to burn my feed. However, I find my feed subscriber number in Google Reader stays at 104(I know it’s quite small) since they updated the “Show Details” feature in late Oct. Feedsky shows me that my feed’s subscriber(in Google Reader) number has gone up to around 160(my total subscriber number is around 290). I don’t know if it is just me who see the subscriber number stays or other people have seen this as well. 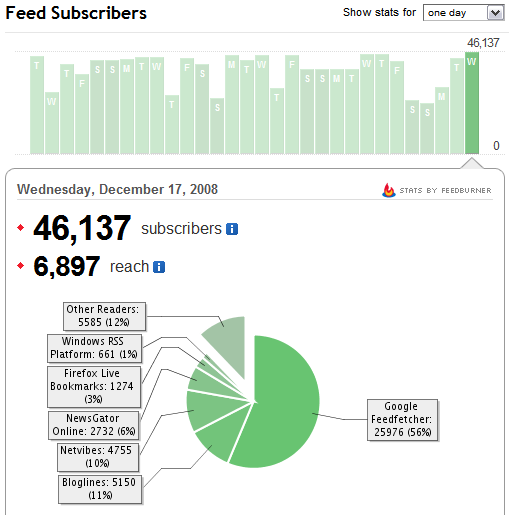 Google’s Feedfetcher use has dominated my feed stats for a long time. Google Reader is the best of all…..too easy to use. Friend’s shared items is really cool. Look forward to being a regular commentor, and participator to your blog, and share knowledge, and learn more. I don’t know if I could bare to watch my blogs go down from another wordpress update. Diversity in the seach results is quite important to Google as I recall. Perhaps The Guardian was taking a similar approach to diversity in their list. (I counted 5% of the list to be Google products) Since Reader is holding such a large share, maybe The Guardian wanted to spur the competition and encourage the Bloglines team? I would like to see Blogger to give this kind of info… There is always place to improvement hopefully. I buck the trend and still use Yahoo!